There is a particular moment in the middle of spring when the air is fresh, the sun is shining, and the first asparagus shoot breaches the soil and is welcomed into the world. This is the beginning of asparagus season. [clickToTweet tweet=”So revered was asparagus that it was used as an offering to appease the Egyptian gods.” quote=”‘So revered was asparagus that it was used as an offering to appease the Egyptian gods. '” theme=”style6″]So revered was asparagus in ancient times that it was used as an offering to appease the Egyptian gods. And today, it is still loved throughout the world, but perhaps not more so than in Germany, where the white spears are favoured over the green and are referred to as ‘edible ivory’. Always wondered what the difference was between white and green asparagus? Well, it’s more than just the color. How it’s grown, the flavor, and even the length of the season are different. The naked color of white asparagus is caused by the vegetable being grown underground, covered with dirt or black plastic. This means that the spears never see the light of day, preventing them from producing chlorophyll, the green-tinted sun to energy turning molecule. This contributes to the sweeter, more delicate flavor—a flavor that is only available during the short-lived white asparagus season. ​Spargelfeste (asparagus festivals) are held throughout Germany to celebrate this spring vegetable, and it’s all too short Spargelsaison—only around eight weeks from the first harvest until the last seasonal spears grace your plate. What happens in between can only be called asparagus fever. One way to experience the madness for yourself is to follow the Baden Asparagus Route. It begins in the self-proclaimed asparagus capital of the world, Schwetzingen, and follows a winding 136-kilometre route south to Scherzheim. Much of the route can be covered by bicycle, and at the peak of the season you can watch the harvest, lend a hand, or join a Spargelfest and enjoy farm-fresh dishes. Snap off a stalk in the garden – it doesn’t get any fresher than that. Raw asparagus tastes ‘green’ and has a delightful crunch. Try it with hummus, baba ganoush, or a blue cheese dip. Toss with olive oil, sprinkle with sea salt, and grill for about three minutes on each side. Use a skewer to keep the asparagus together – it makes it easier to turn them on the grill. For a flavour injection, first, wrap the spears with bacon. White asparagus, which is thicker and more fibrous, needs to be peeled before it is cooked. In Germany, it is traditionally boiled and served with potatoes, ham, Schnitzel, or smoked salmon. You’ll be able to enjoy green asparagus with a bit of a crisp bite, but don’t look like a how to eat asparagus rookie by not cooking the white variety all the way through. Asparagus soup is an excellent way to keep warm on those evenings when sunny spring hasn’t quite sprung. It needs few ingredients, but they go a long way toward a great taste. Pickling your asparagus ensures it’s available year-round, at least in your pantry, and gives it a nice tang. Green and white spears can also be used in pasta dishes, salads, risotto, and on pizza. Its versatility has no limits. In ancient times, asparagus was renowned as an aphrodisiac. The Greeks are said to have believed that the vegetable was an herbal medicine that would, amongst other things, cure toothaches and prevent bee stings. The Romans loved asparagus and grew it in high-walled courtyards. They are responsible for spreading it to the Gauls, Germans, Britons, and the rest of the world via their conquests. Yes, it’s true. This is one vegetable that does make your urine smell (although not for/to everyone). Even Benjamin Franklin noticed it. The cause? Well, that can be blamed on asparagusic acid, which is converted into sulfur-containing chemicals. Under ideal conditions, an asparagus spear can grow 25.4 centimetres in 24 hours. 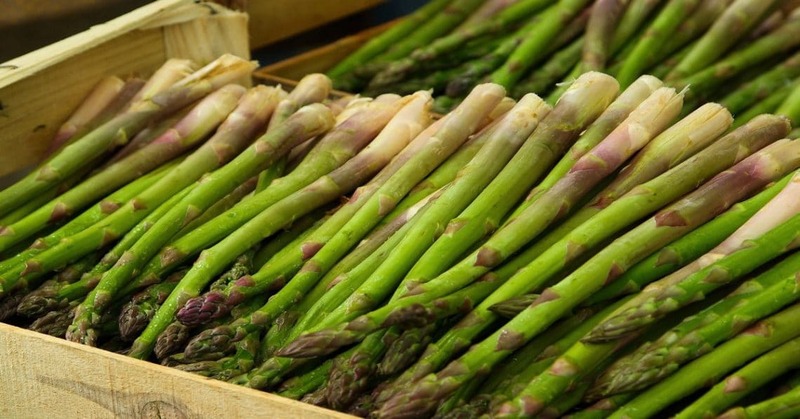 ​Do you prefer white or green asparagus and what’s your favorite way to eat it? Learn how to eat even more of the best food from around the world right here. One Response to "How to Eat: Asparagus"